I masked off a centre panel and sponged on Victorian Velvet and Bundled Sage DI and stamped text from SU French Foliage in Victorian Velvet. Stamped the stems and sentiment in Brilliance black . Thanks to a little mistake with the inks I've added 2 corners but I quite like it!!! We're looking forward to seeing Charlie and Phoebe at the weekend so I hope the weather stays fine. Very beautiful, love the panel of colour and the lovely image. Sooo creative, Val! 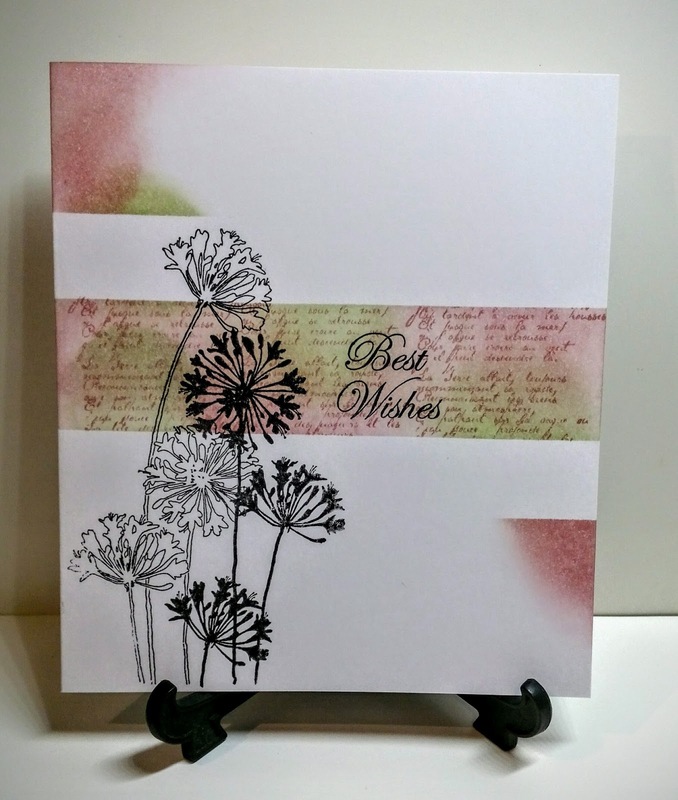 Beautiful inky panels with the manuscript and your flower stamp is so detailed while still keeping it CAS. beautiful one layer card, val!! Great card Val. Lovely colours and like the corners.....even if they were a happy accident!!! lol They balance the whole card. A fantastic and super elegant silhouette design. Love your inky blending and BG perfection. thanks so much for playing along this week! Quite encouraging for me to read that people, like you, who I find to one layers so well also have cards that end up in the bin. This looks so dimensional! I love this background stamping Val, it's really subtle and very effective! Fab inky layers for your one layer Val, looks amazing. Sorry about the rejects though, happens all the time to me mind you! sorry am late commenting have had puter problems . Love this card and love the corners its really effective, gorgeous, gorgeous stamping and love how you created the panels. I do aqua aerobics and I love it really perks me up . Love the design Val - the stems are fabulous and really "pop" from the background. Your little "mistake" has worked wonders too - well done! Just saw the pictures of your beautiful grandchildren - they are adorable!